Releasing an animal from Wild Care seems like a simple thing; an animal comes in sick or hurt, we fix it and then we let it go. Simple? Not really. Knowing when to release an animal is not always clear. .. The Outer Cape has no shortage of coyotes, though a recent coyote hunting contest sponsored by a local sporting goods store has stirred up controversy about the presence of these furry neighbors. Stephanie Ellis, Executive Director of Wild Care, offers some insight on the often misunderstood behavior of these curious canines. Wild Care Inc. hosted their largest fundraiser of the year – “WILD WINTER NIGHT” which generated just over $30,000 for Wild Care. There is no “off-season” for the staff at Wild Care as they continue providing emergency care to wildlife in need from across the Cape. 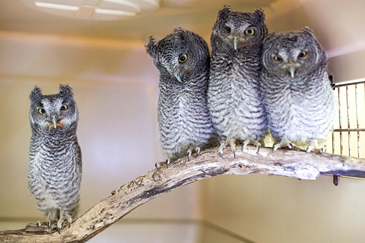 Winter presents many challenges to wildlife and brings different species into the care center. Wild Care received six dovekies late last week. A sea-faring species, the birds were blown inland due to high northeast winds from a cold front that swept Cape Cod and much of Massachusetts Dec. 17. Two of the birds survived and were released Dec. 20 from a Center for Coastal Studies Research vessel. A red morph Eastern screech owl survived being struck by a car windshield Saturday night and is in stable condition, according to Kate Diggs, a wildlife rehabilitator at Wild Care Cape Cod. The owl was brought to Wild Care Cape Cod, a wildlife rehabilitation center in Eastham, at around 9:30 a.m.
Wild Care Inc. rehabilitated a juvenile Piping Plover this past summer. The bird was evaluated, but was determined not releasable back to the wild due to a compromised wing, and an inability to fly at full range. Many of us have had the experience of a bird crashing into a window of our house, and the almost knee-jerk response to grab a shoe box, go outside, and make sure that it is OK. But what happens when that animal is a 100-pound turtle, a shark, or a whale? The Golden-crowned Kinglet is a bird I fell in love with as a 6 year old child. I would visit my aunt on the weekends and we would snap together “paint-by-number” models of songbirds; the little Kinglet was one of my favorites. You can help Wild Care reach a goal of $4,800 to purchase equipment that provides sterile and organized examination to our patients, and keeps our staff safe while doing so. THANK YOU to our AMAZING friends at Nauset Disposal for making Wild Care a recipient of their Trash Bash again this year! Nauset donated $2,000 to Wild Care! She had just spoken to the Mass Audubon Wellfleet Bay Wildlife Sanctuary who told her to call us. There were birds in her wood stove, “and two are already dead!” She had been trying to get them out herself but was unsuccessful. A distraught woman appeared at our door holding a bird feeder. A mouse was trapped in between closely spaced bars. It had somehow weaved itself through the tight spaces, and locked its body so it could not move any appendage.